SPRING is here (in my neck of the woods), and it’s time to get the garden ready! I am on year four of my desert garden adventure, and things just keep getting better! Now that I have learned (through trial and error) what grows well in the desert, I’m ready to focus on what plants help each other in the garden. Want to learn, too? I thought you might! Instead of just randomly placing my plants in the garden (which I have done in the past), I decided to find out which plants should and should not go together. I found a fantastic resource at WestCoastSeeds.com. I’ve linked you to a document about companion planting. I had a really hard time keeping track of the twenty-four different plants I want to include in my garden. To keep it all straight, I created this companion planting chart and planned my square foot garden boxes based the chart. I hope it helps you decide what to plant as well. I also found great info about plants that repel garden bugs. I created a chart for that, too! If the plant you are looking for is not listed, check out the website above. I did not include all of the plants listed on the website. This is awesome you did for me what i was wanting to do!!! Followed you here from the Show Me What You Got Link Up. Love the chart and tips. 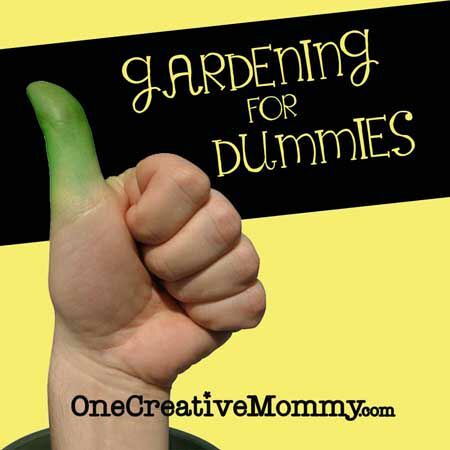 I am definitely a dummy when it comes to gardening. I will be using this for sure. Very useful! Thanks for sharing. I may have to pin this so I can remember this while planting. Heidi thanks for the great post! The companion planting guide is a huge help! It’s been in the 30’s here and a snow storm is on the way for Sunday. I can’t wait for warm weather so that we can get out in the yard. I am so ready to garden! This is just the perfect thing to kick things off. Thanks for sharing at What’d You Do This Weekend?. Thanks so much for all the great gardening ideas I’ve found on your blog today! I’ve been pinning like crazy. 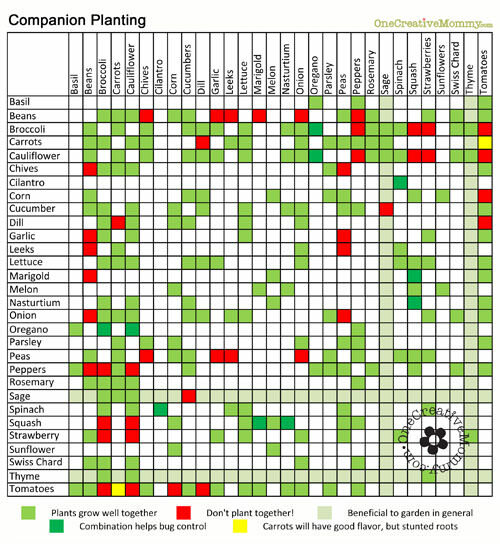 Companion Planting: How close do the plants need to be in order to get the benefits? (Or how far do they need to be from each other to avoid the negative effects?) I just have a 4×4 square, with some additional vertical plants on one side. Is my garden too small to worry about companions? I replied to Ruth via email, but I thought you all might like to hear the answer. I am not a gardening expert. I learn more and more every year, but I don’t know enough yet to answer this question. I suggested that Ruth visit or call her local nursery to find the answer. As for me, I think no garden is too small to worry about companion planting–especially things that should not be planted close together. Great chart and great idea. There are a couple of errors on the chart though, in case you want to fix them. If you follow chives on the left to peppers on the top and then go the other way peppers on the left to chives along the top, it is not the same color code. Also if you do the same for squash to broccoli and squash to cauliflower and then the opposite way. If you fold the page up the diagonal, the pattern should be exactly the same. The lady that first noticed on facebook said there are some “good” combos that don’t match as well. It’s a great idea and great resource so thought I would share the difference in case you wanted to fix the chart. Thank you so much for catching those errors, Sue! They have been corrected. Excellent, it’s a great chart! You are a genius! Last year I tried to come up with a chart to easily see what plants to put together and it just ended up a confusing mess. This is amazing and so simple. Thank you! Thanks a lot! Really useful info! Wow! just what I was looking for– Thanks for all your hard work! So I am kind of new to gardening. Why cant I plant beans with onions or peppers? I did both without knowing any different. So far so good but what is gonna happen? That is so sweet of you to say, Rachel! I’d love to see your square foot gardening post. I’m afraid that I spent too much time blogging and not enough time tending the garden this summer. Most plants did okay, but I had some totally fail because I let the bugs get them! I’ll do better next summer! I’m off to check out your site. Thanks again for leaving such an encouraging comment! Thank you so much for posting this! 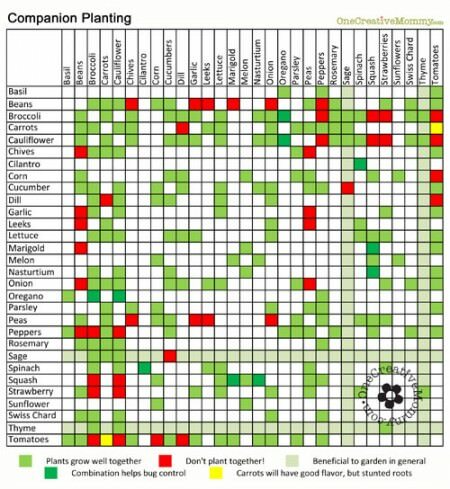 I have been reading about companion planting and trying to keep everything straight, but this chart makes it so much easier. Thanks for putting the work into it and sharing it! You’re welcome, Rebecca. That’s exactly why I made it. I was having the same problem. It can get so confusing! Thanks, LouAnne! Good luck with your garden. That is really impressive, you did a really good job. 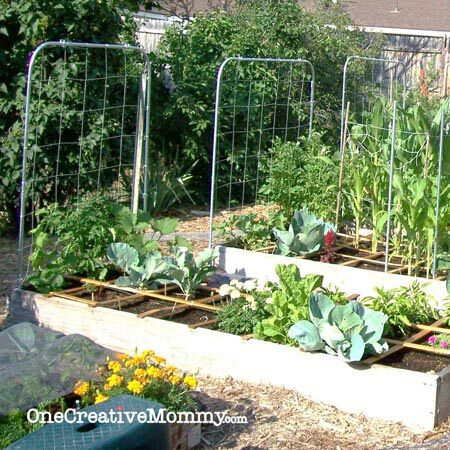 I think gardens are fantastic, there is nothing like growing your own fresh veggies and herbs. Thanks, Lisa. I totally agree. I love to watch everything grow! 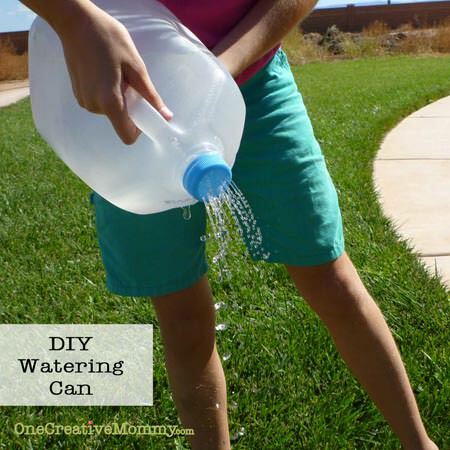 I love this DIY water can you shared. I am going to make one for my daughter! Thanks, Heather! Have fun with it! I think it’s been two years since we made ours. After finishing the gallon of milk this morning, my six-year-old announced that it is time to make one again! WOW! I really could have used this last year before I killed all of my plants! Pinning for this year and crossing fingers for success! Thanks, Emily! I’ll cross my fingers for you, too! Oh wow, this is really helpful! I had a little balcony garden last year, and some of my plants didn’t do that well. I think I’ll probably stick to herbs this year, because we’ll be moving late spring/early summer, and those will be easier to move to our new home. That’s smart of you, Elisebet. Herb gardens are great. Every little bit helps! Good luck with your move. Oh how I love gardening posts! That DIY watering can is hilarious and genius at the same time. I’m going to try some of these ideas. Funny, isn’t it? My youngest is always trying to save milk jugs so that she can make more! This is brilliant! We sprinkled a packed of wildflower seeds in our garden last year and they completely took over the place. We just spent a day pulling them all up and now I need to find something else to plant in the beds. I’ll be studying this chart later! Good luck with the garden, Clare. I hope this helps! I don’t have a big space to garden, plus I have a black thumb. But this is great for all those that do garden. Thanks for sharing it! Black thumbs can turn green with practice, Jennifer! Believe me. I know from experience! This is so helpful! I have the space to garden but not the time. I need to step it up! Lucky you to have the space, Krystal! The time will come someday. Do not believe every one of these charts. For example, this show that peas and beans (nitrogen fixers) are good companions for strawberries. However, strawberries are light feeders during the season. If they get too much nitrogen, they produce too much foliage which shades the fruit and results in less, and less sweet, fruit. We need to use our common sense about this. I have found that planting twigs of Rosemary around other plants helps to keep the squirrels (and my dog) away. Thanks for sharing your tip, LovinFood! I can confirm that dill does NOT repel aphids. The worst garden aphid infestation I’ve ever experienced was when I planted dill. They were sucking the life out of it. But then the ladybug larvae showed up and decimated the aphids! I guess how dill works as a companion plant is that it attracts aphids to itself and hopefully they don’t notice the rest of the plants? LOL. Thanks, Diane. That’s how I like it, too. I was going crazy reading through lists and trying to cross reference it all! Oh boy…I got some rearranging to do! :) I just do the container garden…so easy to move containers around…but wow….seems like everyone doesnt like someone! Haha…this is going to be like musical chairs! :) Thank you for the fantastic info!!! Thanks for the printable! Companion planting is of a great help to people who want to discourage harmful pests without losing the beneficial allies. I started last year with planting a Three Sisters garden and then came the idea of companion planting. I think that was the best choice I’ve made for my garden. Greets! I love this! 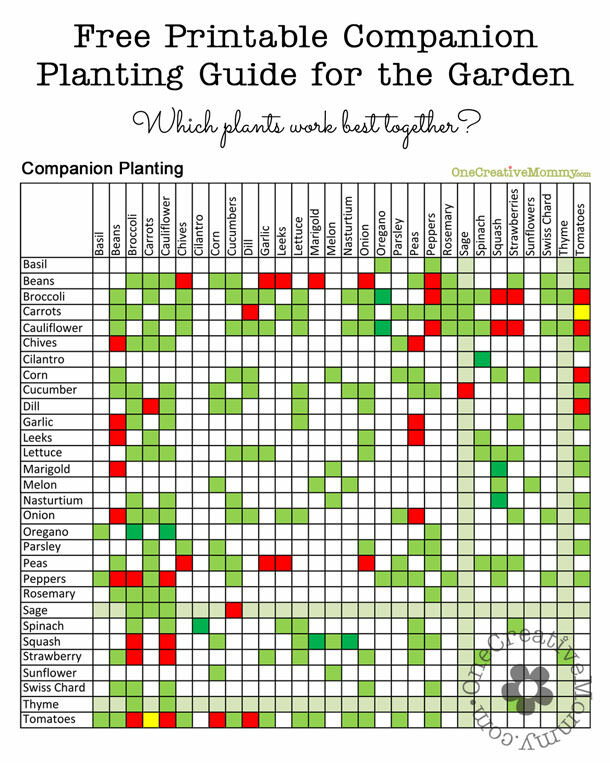 Thanks – I pinned it for all of my gardening friends to see because it is the nicest chart I have come across! This is so helpful! thank you. I went to your website and searched Celery and Beets, no luck. Any info for what to plant these next to or not? Sorry, Rhea, I don’t have any experience growing celery or beets. I would suggest googling it. Good luck with your garden! This is awesome article.I am reading your Blog posts daily.I have also subscribed to your Rss feed. I like your article very much because you have posted on a very important thing i see people posting on technology , gadgets and many more things but i love articles like this who always strive to aware people regarding to the care of environment . i think everyone should try gardening as plant as many as trees they can because now a days people look to the cut the plant more rather then growing them … kudos to you ! An initative taken by you is commendable,it is trying to make people aware about the necessity of environment and its ways in which care can be taken of..!!! keep sharing more such encouraging posts!! Very, very helpful resources, Heidi! I love when the things are so clear and easy to follow! Thank you!